The Market for Liberty is that second type of classic, and what a treasure it is. Written by two authors—Morris and Linda Tannehill—just following a period of intense study of the writings of both Ayn Rand and Murray Rothbard, it has the pace, energy, and rigor you would expect from an evening's discussion with either of these two giants. This book is very radical in the true sense of that term: it gets to the root of the problem of government and provides a rethinking of the whole organization of society. They start at the beginning with the idea of the individual and his rights, work their way through exchange and the market, expose government as the great enemy of mankind, and then—and here is the great surprise—they offer a dramatic expansion of market logic into areas of security and defense provision. Their discussion of this controversial topic is integrated into their libertarian theoretical apparatus. It deals with private arbitration agencies in managing with disputes and criminality, the role of insurers in providing profitable incentives for security, and private agencies in their capacity as protection services. It is for this reason that Hans Hoppe calls this book an "outstanding yet much neglected analysis of the operation of competing security producers." The section on war and the state is particularly poignant. "The more government 'defends' its citizens, the more it provokes tensions and wars, as unnecessary armies wallow carelessly about in distant lands and government functionaries, from the highest to the lowest, throw their weight around in endless, provocating power grabs. The war machine established by government is dangerous to both foreigners and its own citizens, and this machine can operate indefinitely without any effective check other than the attack of a foreign nation." Also overlooked is the Tannehill's challenging plan for desocialization or transition to a full free society. They argue against privatization as it is usually understood, on grounds that government is not the owner of public property and so it cannot sell it. Public property should be seized or homesteaded by the workers or by people with the strongest interest it in, and then put on the open market. If that sounds crazy or chaotic, you might change your mind after reading their case. What's remarkable is how this book actually predates Rothbard's For A New Liberty. In fact, Rothbard chose it as one of the top 20 libertarian books of all time, to be printed in his series for Arno Press. It had a huge impact when it came out in 1970, especially among the generation that was debating the question of whether the state needed to provide "night watchman" functions or be eliminated all together. The authors were drawn to Rand's ethical outlook but Rothbard's economics and politics. But, clearly, they were surrounded by classics of all ages when they wrote. So this fiery little treatise connected with the burgeoning movement at the time, providing just the type of integration that many were seeking. Since the 1980s, however, the book has languished in obscurity. If the authors are still around, no one seems to have heard from them, a fact which seems only to add to the mystery of this never-to-be-repeated book. Who should read this book? It makes a bracing read for a person who has never been introduced to these ideas. No reader could be left unchanged by it. For the person who has an appreciation of free enterprise, this book completes the picture, pushing the limits of market logic as far as it can go. For those who have been drawn to the argument concerning insurance agencies in the free market, this explanation is still the most extended in print. Is government a necessary evil? No, it isn't even necessary according to the authors, who demonstrate how the market can replace every legitimate function of government while dispensing entirely with its truly evil functions such as taxation and war. This is a purely theoretical work and because of this may leave some readers unconvinced, but further reading - go straight from here to Murray Rothbard and to Mises' "Human Action" - will further develop these ideas and show the Tannehills, despite some minor points one could quibble over, to be right. The authors correctly oppose violent revolution and "propaganda of the deed", as well as retreatism, as being counterproductive non-starters. The way to get there from here, they note, is through the spread of ideas. By merely demonstrating how the State is unnecessary, the Tannehills have already made a good start in that regard. from Boulder, CO A must read, must own title! I just finished this book on the recommendation of Doug Casey (he often sites it and the Virtue of Selfishness by Ayn Rand and his two top most influential books). It truly deserves the highest rating. It's very clear, concise, easy to read, and extremely thought provoking. I recommend it to anyone. It covers a great deal of ground; all of which can be backed up by in-depth volumes. If you are into limited or no government, I recommend it to help you hone your ideas and be better able to discuss the merits of free markets (in areas such as national defense, security, and legal disputes which are often topics skeptics bring up). Or, if you think "anarchy" means a crazy, violent, chaotic world- then this book is also for you. "Government is not a necessary evil- it is an unnecessary one." 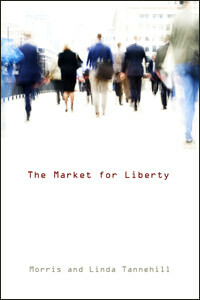 I enjoy reading liberty books and "The Market for Liberty" is my favorite book. By the way, another great book is "The Ethics of Liberty" by Murray Rothbard. What I like about The Market for Liberty is how liberty is a practical solution. Like most of us reading Mises.org, we agree that freedom is ethical and also increases production output which raises standard of living of everyone. This book however explains difficult liberty concepts, such as the arbitration for resolving disputes, coercion, defense agencies, protection, organized crime and law. A great article to read is "Justice Entrepreneurship In a Free Market" at http://mises.org/journals/jls/3_4/3_4_4.pdf. This article is rather short (22 pages) however it contains very powerful concepts. Reading this article is a big eye opener on the origin of justice and how disputes are resolved in a free society. Another great book to consider is "Anarchy and the Law" which I also read. In Give Me Liberty, originally published in 1936, Lane called for a return to American individualism and a repudiation of the New Deal.